^ 根据德意志帝国海军的命名法，该炮的官方名称为30.5 cm SK L/50。其中SK（Schnelladekanone）表示“速射炮”，而L/50表示炮管长度，即50倍径。见： Gröner，第23-30页. ^ Gardiner & Gray, p. 135. ^ 4.0 4.1 Gröner, p. 27. ^ 5.00 5.01 5.02 5.03 5.04 5.05 5.06 5.07 5.08 5.09 5.10 5.11 Gröner, p. 28. ^ 6.0 6.1 Tarrant, p. 286. ^ 7.0 7.1 7.2 Breyer, p. 276. ^ 8.0 8.1 Gardiner & Gray, pp. 147–148. ^ 11.0 11.1 NavWeaps (15 cm/45). ^ 15.0 15.1 Tarrant, p. 31. ^ 35.0 35.1 Halpern, p. 215. Breyer, Siegfried. Battleships and Battlecruisers 1905–1970: Historical Development of the Capital Ship. Garden City: Doubleday and Company. 1973. ISBN 978-0-385-07247-2. Gardiner, Robert; Gray, Randal (编). Conway's All the World's Fighting Ships: 1906–1921. Annapolis: Naval Institute Press. 1985. ISBN 978-0-87021-907-8. Gröner, Erich. German Warships: 1815–1945. Annapolis: Naval Institute Press. 1990. ISBN 978-0-87021-790-6. OCLC 22101769. Halpern, Paul G. A Naval History of World War I. Annapolis: Naval Institute Press. 1995. ISBN 978-1-55750-352-7. OCLC 57447525. Herwig, Holger. 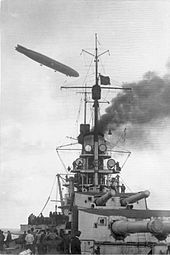 "Luxury" Fleet: The Imperial German Navy 1888–1918. Amherst, New York: Humanity Books. 1998 . ISBN 978-1-57392-286-9. OCLC 57239454. Massie, Robert K. Castles of Steel. New York City: Ballantine Books. 2003. ISBN 978-0-345-40878-5. OCLC 57134223. Tarrant, V. E. Jutland: The German Perspective. London: Cassell Military Paperbacks. 2001 . ISBN 978-0-304-35848-9. OCLC 48131785. DiGiulian, Tony. Germany 30.5 cm/50 (12") SK L/50. NavWeaps.com. 2008-09-28 [2009-07-17]. DiGiulian, Tony. German 15 cm/45 (5.9") SK L/45. NavWeaps.com. 2007-07-06 [2009-06-29]. DiGiulian, Tony. German 8.8 cm/45 (3.46") SK L/45, 8.8 cm/45 (3.46") Tbts KL/45, 8.8 cm/45 (3.46") Flak L/45. NavWeaps.com. 2009-04-16 [2009-06-29]. DiGiulian, Tony. German Torpedoes Pre-World War II. NavWeaps.com. 2007-04-21 [2009-07-17].